There is a place or plantation which is so full of history, legends and of course ghosts that I can only scratch the surface in this column. Hand prints in the mirrors, footsteps on the stairs, mysterious smells, and vanishing objects, death by poison, hangings, murder and gunfire are all part of the norm. No it isn’t scenes from a soap opera, it’s the Myrtles Plantation located west Feliciana town of St. Francisville, Louisiana. The original owner, David Bradford (1760-? ), had his run-ins with the good and bad aspects of society. Even President George Washington had a price tag on his head but Bradford never started off that way in the America so young. Bradford was born in America to Irish immigrants and was one of five children. He became a successful attorney, businessman and Deputy Attorney General for the county. Why did Bradford leave his family and thriving business behind? We do know that he became involved in the infamous Whiskey Rebellion and legend has it that Washington placed a price on the man’s head for his role in the affair. President John Adams would later pardon Bradford in 1799. The Whiskey Rebellion took place in western Pennsylvania and really began as a series of grievances over high prices and taxes forced on those living along the frontier at that time. In later years Bradford had such a rich and adventurous life that it would make the perfect miniseries for TV. Over the years books were written about the place and TV shows were produced at the plantation. Like I stated, legends are a huge part of the plantation. According to one legend, three Union soldiers were killed in the house after they broke in and attempted to loot the place. It was here that they were shot and died. Legend has it that they left bloodstains on the floor and no matter how hard maids scrubbed the stains, they simply wouldn’t get cleaned. Hester Eby, director of tours, has been an employee and a witness to the paranormal at the plantation for over 20 years. She explained that one of her paranormal experiences happened on a normal day. Or so it would seem. I was getting ready to greet the guests. I saw a couple get out of their car but the man was way ahead of his wife and their little girl dressed in a pink and white dress, said Eby. There are many places at the plantation where Eby has experienced paranormal activity. In the lady’s parlor, behind the couch, her clothes felt like it was being tugged on. “The way a child would do if they wanted to tell you something and you’re talking to someone else,” explained Eby. “I had my name called before,” said Eby. The spirits would pick up on the voice they would like so you think it would be a co-worker, she said. It happened to us so much that if that person who called us is busy in what they are doing that we just forget about the incident and we just go on. The spirits also do that to guests as well. A lot of the time the guest would ask if they were being called. As she was walking from one wing of the house to the next she heard very heavy footsteps walking behind her. When she stopped, the footsteps would stop. The minute she started walking the footsteps would begin again. The footsteps stopped when she walked backwards down the stairs so she could keep an eye on what was behind her. The plantation has tours every week. A mystery tour is held twice a week and a historical tour every day. “We have a little bit for everyone,” said Eby. Ronald Wolf is a college graduate of a renowned journalism program at Niagara College in Welland, Ontario. He has been published in numerous newspapers and magazines in three different countries. He is a former newspaper owner who specializes in photography and writing. 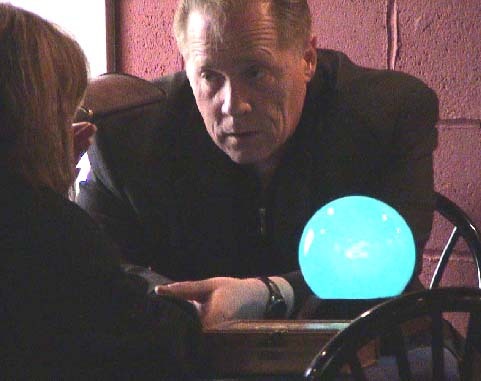 Historical research, research of the occult and interview skills make Wolf a natural writer of the paranormal. His voyage into the supernatural started in the 5th grade when he read his first Hans Holzer book. Wolf presently writes a weekly column entitled Things That Go Bump in a Canadian Night. He presently resides in northwestern, Ontario Canada. He has an active website at http://www.flickr.com/photos/22025727@N04/ where he posts his previous and active works of journalism and videography including the paranormal. If you would like to contact him please do so at rwolf65@hotmail.com. The saga of the Antebellum South and a lifestyle that will be forgotten lives on at The Myrtles Plantation, a 205-year-old home that is listed on the National Register of Historic Places. A first glimpse of the home with its magnificent double dormers and lacy grillwork of the 125-foot-long front veranda envelops one with a complete sense of peace and tranquility. "One of America's Most Haunted Homes"
Saint Francisville is located in West Feliciana Parish Louisiana. A small town on the Mississippi River. Once the Capital of the Republic of West Florida, it is here that John James Audubon (Birds of America Collection) created over 80 of his beautiful watercolors. There are seven Magnificent Plantation homes opened for public tours. And The Myrtyles Plantation is the one you would not want to miss. And with all the recent investigations by TAPS is now fast becoming the most famous ghost filled haunted house in America. Exploring the myrtles you will see grand fine antiques and architectural treasures of the old South and you personally might discover why The Myrtles has been called "America's Most Haunted Homes". "Whiskey Dave" Bradford--former leader of the whiskey rebellion-- built the great haunted house on a Tunica Indian burial ground in 1794. He was actually the very first to see a ghost at the Myrtles Plantation, a naked Indian girl wandering lost on the grounds is what he is said to have observed. But Many of the locals state it is Bradford's' many ghostly children and grandchildren that haunt the Myrtles today. When Woodruff grew tired of Chloe, and she was afraid she would be sent to the fields she is said to have started eavesdropping on him to learn of her future fate. When Woodruff caught her, he cut off her left ear and sent her to work in the kitchen. From then on, Chloe wore a green turban to hide her disfigurement. She devised a plan to regain the affection of him and the family. She boiled poisonous oleander leaves and baked them into a cake. Chloe believed the children would become ill and need her to nurse them back to health. But she used too much. Sara Matilda and two of the children died that night from the poison. When the other slaves heard about Chloe's actions, they hung her from a tree. They then weighted her body with stones and threw her into the Mississippi river. Chloe still wanders the house and grounds of the Myrtles Plantation. She sometimes shows up in photos. The Woodruff children are also heard playing and laughing on the veranda on rainy nights. The Chloe story is the most popular haunting tale at the Myrtles, but many more people met their untimely demise on the premises and can be seen and heard wandering. William Winter was said to have died on the 17th step of the staircase after a mysterious man shot him through the study window in 1871. The steps heard on the stairs in the middle of the night are attributed to him. Those who count claim the footsteps stop at the seventeenth step. Another young girl died of yellow fever in one of the upstairs bedrooms. Her parents called on a voodoo priestess to help her, after all traditional medicines had failed. When the little girl died, the parents hung the priestess from the chandelier. In 1927, the caretaker was murdered during a robbery attempt. The owners claim that he can sometimes be seen at the plantation gates telling people to leave. The Myrtles is now a bed and breakfast, so guests can stay in these rooms and see if the ghosts come out and play. The proprietors, John and Teeta Moss, claim that the Best Western loves the Myrtles, because so many guests get spooked in the middle of the night and run to the other hotel. Whether you believe in ghosts or not, it's fun to be scared. This house has a creepy vibe. Bursts of cold air come from nowhere. Former owners have had church stained glass installed in the front doors to keep out the evil spirits. Also, the keyholes of every door have a small cover over them. In the nineteenth century, people thought ghosts came into a house through its keyholes, and these covers were designed to keep them out. People also believed that the ghosts would hide in the corners until nighttime, when they would come out to pester the living. The Myrtles contains custom plaster work nun and cherub charms specially designed to keep the spirits away from the corners. Every resident has painstakingly tried to protect himself from wandering spirits. Ghosts or not, everyone who has owned the property has either seen ghosts, has turned into a ghost, or tried to keep the ghosts away. Mysterious figures and spheres often show up in ghost photos. The Myrtles has been featured in New York Times, Forbes, Gourmet, Veranda, Travel and Leisure, Country Inns, Colonial Homes, Delta SKY, and on the Oprah Show, A & E, The History Channel, The Travel Channel, The Learning Channel, National Geographic Explorer, and GOOD MORNING AMERICA. It was also featured in The Hauntings of Louisiana. And recentlyon the Sci-fi chanal Ghost Hunters show featured by TAPS. All bed and breakfast reservations include a complimentary tour of this National Historic Register home filled with hand painted stained glass, open pierced plaster frieze work, Aubusson tapestries, Baccarat crystal chandeliers, Carrera marble mantles and gold leafed French furnishings. Guided tours include the history, the architectural significance, and the enchanting stories of mystery and intrigue. Relax in the giant rockers on the 120-foot verandah or stroll through the lush ten acres filled with majestic live oaks. The 5000 square foot old brick courtyard is the perfect place to unwind before enjoying a delicious candlelight dinner at our Carriage House Restaurant. Located in the Legendary Plantation Country on U.S. Highway 61, 30 miles North of Baton Rouge between New Orleans, Louisiana and Natchez, Mississippi. 10 a.m. - 4:30 p.m.(last tour). For information, please call 1-800-375-7151, daily from 9 a.m. to 5 p.m., or write to us at 4250 Hwy. 308, Napoleonville, LA 70390. Nottoway Plantation is a great bed & breakfast, and its grand white ballroom is a favorite for weddings. At the edge of sugar cane fields, Nottoway stands overlooking the Mississippi River. This enormous mansion, completed in 1859, reflects an unusual combination. Greek revival architectural elements blend with innovations that were the fanciful desires of the original owner. Not only is the floor plan irregular, but the house contained many elements that were innovative and rare in the mid-19th century, such as indoor plumbing and hot and cold running water. Today Nottoway is open daily to the public. perhaps even get married in this magnificent plantation! Site of the Battle of New Orleans in 1814–1815, (the last battle of the War of 1812), the Civil War Chalmette National Cemetery, and Beauregard House. Two historic Antebellum Plantation Homes within 30 minutes of New Orleans are Destrehan and Ormond Plantations. what Lonely Planet calls "The Best History Tour in the U.S."
The morning following the fire, guests continued to come. And they still do. La Branche Plantation Dependency House on the River Road in St. Rose, LA is what we call a Garconniere. The Zweig family, of Germany, built the plantation in 1792. Because of neglect, the effects of the Civil War, the economics during and after Reconstruction, and the division of the property among heirs, there is little left to indicate what was once there, save for "an alley" of Oaks. The site of the main house is on private land, and is not accessible to anyone, without the permission of the owners. The Dependency House is on land currently owned by the Lentini family, and is open to the public. Included in the inventory is the actual bathtub of Zachery Taylor. One of the most visited Antebellum Plantation Homes near New Orleans. It was used as the filming location for the film "Hush, Hush, Sweet Charolette," starring Bette Davis. Not only do tourists come by the busloads, but locals may make the drive to spend a couple of hours on the grounds, followed by lunch in nearby restaurants, before returning home. Houmas is a home with the architectural style that most people envision when they think of the old plantations. It was used as the filming location for the film "Hush, Hush, Sweet Charolette," starring Bette Davis. A survey conducted by The National Retail Federation showed that in excess of 24 million Americans planned to attend a haunted house for Halloween 2010. Chances are you won't find a real ghost... but the thrills and chills factor will make you want to go tour these really spooky creepy haunted houses again and again! HAUNTED AMERICA TOURS Official Web Site is a ghost tour information site; our information is only as reliable as readers' contributed ghost and haunted reports. It is considered for entertainment purposes only. Many stories might be fictions or Urban Legends. No part of this may be reproduced without written permission. We assume no credit for your adventures, and accept no liability for your misadventures. Use common sense. Read our ghost hunting recommendations. Before visiting any "haunted" site, verify the location, accessibility, safety, and other important information. Never trespass on private and/or posted property without permission from the proper authorities.